If you need the highest levels of security on your USB Flash drives, and are willing to pay the extra cost to get it, here is our pick for the top commercial flash drive to keep your data safe. After reviewing the features, benefits and price of nearly a dozen secure flash drives, we selected the Kingston Digital Data Traveler family of drives. These come with 256 bit AES (Advanced Encryption Standard), which is the highest available level and sufficient to protect classified information up to the “TOP SECRET” level. This makes the Kingston suitable for government agencies as well as corporate use. As an aside, for most government agencies – including county, state and federal, as well as many contractors and sub-contractors – these devices must meet with “TAA compliance” guidelines in order to be eligible for purchase by the agencies, or by their employees. TAA refers to the Trade Agreements Act (19 U.S.C. & 2501-2581), which essentially requires all U.S. government agencies to purchase only goods that are U.S. made or manufactured in a country that is part of the agreement. Fortunately, these drives meet with applicable TAA compliance guidelines. Encrypting files isn’t enough to guarantee security. You have to make sure that someone can’t simply copy the files to other machines and then use brute-force attacks to attempt to crack the security. Before using the Flash Drive, you will be prompted to create an access password. The set-up enforces complex password protection with minimum characteristics to help you create a strong password. This is all done to prevent unauthorized access. Now you have 100 percent protection of data stored on the drive. Regarding the security features, the drive locks down and re-formats itself after 10 intrusion attempts. It also features a read-only access mode (enabled via SafeConsole for the Managed model) to avoid potential malware risks. So if you share the device across multiple computers, with the read-only mode engaged you don’t have to worry about the device picking up potentially harmful code which would infect your system when next using the flash drive. In the majority of uses, the flash drive will be used to exchange data among two or more computers, and will need to have write access for each system. 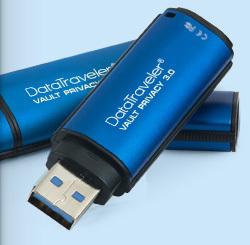 In this case, Kingston has built in Anti-Virus protections with “DataTraveler Vault Privacy 3.0” with easy-to-deploy Anti-Virus protection from ESET that protects the drive’s content from viruses, spyware, trojans, worms, rootkits, adware and other Internet-borne threats. The ESET NOD32 anti-virus engine provides instant alerts. Requiring no installation, this anti-virus protection comes with a five-year pre-activated license. For businesses and government agencies, the IT administrators can centrally manage secure USB drives to meet compliance requirements and provide a higher level of support. Activation is a simple process and allows IT professionals to remotely set passwords, configure password and device policies, activate audit for compliance and more. These powerful tools simplify drive integration, operation and management, even in remote locations. These flash drives are all rated for USB 3.0 transfer speeds. Security is great, but if you can’t quickly transfer data to and from the drive then it wouldn’t be very useful. Nearly half of the secure drives we reviewed were only USB 2.0 compliant, which dropped them from the list. USB 3.0 can handle up to 5 Gbps (640 MBps), which is more than ten times faster than the 2.0 maximum of 480 Mbps (60 MBps). These are the theoretical maximums, and real-world will be lower. Also keep in mind the higher speeds on these devices are for reading data, and that in actual usage the writing process will be significantly slower than reading. This read versus write difference is similar across all flash drive manufacturers. On the physical side, these are waterproof for up to 4 ft., conforming to IEC 60529 IPX8 (European system of test specification standards for classifying the degrees of protection provided by the enclosures of electrical equipment. and an IPX8 designation is for continuous underwater use). If you just need an everyday Flash Drive, you can get a 128GB for around $30. Take a look at our recent review for the 4 Best Inexpensive Memory Sticks .